Yay! I get to Bake!!! Plans change when you least expect it. Lately I have had such an overwhelming sense of gratitude! --An overwhelming feeling that I feel the tears of happiness. My mother, who made my childhood challenging, but taught me to be strong; despite the hard times in life; you MUST pick yourself up and try again. -To never quit! At a young age, I watched her leave an abusive situation; leaving everything behind to start over. I am so proud of her. So proud that despite her challenges, she has had a very successful career and was able to retire and reap what she sowed. I love you tremendously! My father, who is stubborn, if not more stubborn than I am. Who was strict in his unwarily ways and made me stay in a place that taught me the best lesson I could ever learn. If it wasn’t for you, who knows where I would be today. Those hoodlum days are behind me, and I’m so glad they are! My 1st husband “Joe” despite the abusive situation and the emotional/mental challenges I faced in our relationship, you made me find the strong willed woman that I am. I found the part of me that can accomplish what my heart desires. I am also so grateful for our son, as he is very precious to me! AND last but not least, I’m so grateful that we are friends. My 2nd husband “Chase” who showed me true unconditional love. You were the love of my life! Even after your death, you continued to show me the effects of your love, and how deep love can resonate with one’s soul. I’m so sorry that you were not able to see your precious baby boy grow up. Despite not knowing or remembering you, I’m so grateful he has your great big heart. He resembles you SOOOO much. -I miss you tremendously! Leanne Haywood, the most wonderful therapist who has been in my life through all those hard times. 14 years we had together, and I will never forget how you assisted me in changing my perspective, and turning those most negative thoughts and deepest dark times into a learning moment; how hard I must fight in order to keep myself together. Thank you for listening, thank you for being there for me, thank you! My 3rd husband “Tom” who took everything “materialistic” away from me… I’m so grateful for you showing me that no matter what hits me in life, I can start over and rebuild. I am truly deeply a strong woman, and with my strength, I can achieve great things in life. I’m grateful that you taught me the value of money. OR shall I say the non-value of money. Jason, you are the man, the rock, and the sunshine on the rainy days here in Florida. I am so happy that I can be the one that guides you to finding your heart, your core, and your strengths. I am so happy that I challenge you to be the better man, than I know down deeply you are! I am so grateful that I can share the wisdom, the love and the congruency of who I am to the core. –I love you! Last, but not least my children. You boys were my rocks, my drive, and the reason for fighting in my life. You are my angels, and I’m so happy that you both are strong enough to be living on your own terms in a state that is many thousands of miles away from me. Moving to FL was a hard decision, and I feel so selfish for leaving you. But as I’ve taught you. You MUST take care of “you” first and foremost. -I miss you boys immensely! The bottom line is that I am here because of me, and the people who have crossed paths with me along this journey. I am a better person because of it, and I cannot wait to see what my future holds for me. On the 23rd, it’s our Christmas Luncheon at our office, and I’m so very excited that I get the opportunity to showcase my baking skills. Time off to do so, and finally, I get to do something I absolutely love to do. Bake, bake and more baking. Baking is so calming for me… I get to use my creative side to express my love and gratitude for food. Okay, sugar but really, I’m excited that I get to unwind and bake without being rushed. 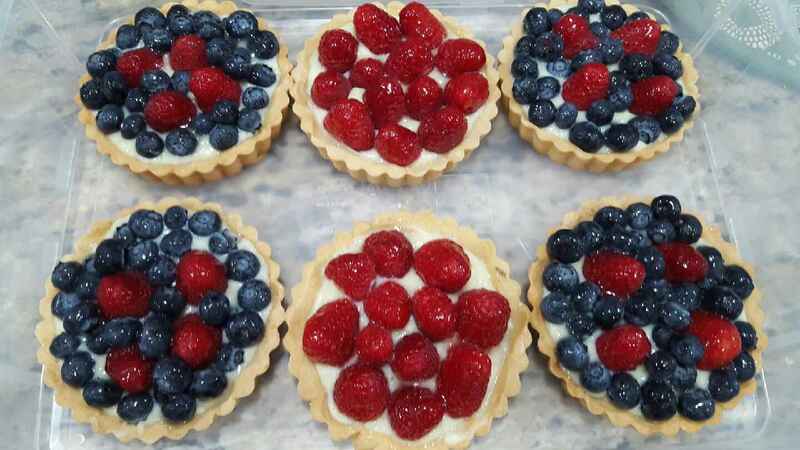 This year’s deserts are… Cappuccino brownies, fresh fruit tarts, and lemon tarts. Just when you make a decision to do something. Wham! Something comes out of left field and changes your plan. I have so many thoughts and things on my mind that I feel so bottled and stuffed like a rag doll. I am so excited that I have 10 days of vacation coming. I plan on unwinding, and taking the time to do those things that I have been too exhausted to do. I can’t wait!